Recorded at the Eugene Goosens Hall, ABC Ultimo Centre. New Zealand-born opera hunk Teddy Tahu Rhodes seems to be flavour of the month just now, with in-depth profiles and newspaper articles left, right and centre. Rhodes turns out to have the voice of a (very robust) angel, and he’s not bad-looking either, with a gym-honed physique that ensures he’s regularly asked to wander about on stage half-naked. 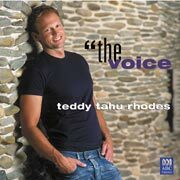 Singers built like Sherman tanks are apparently a tad passé on Planet Opera these days, and if the new breed are anything like Teddy Tahu Rhodes, I could probably even acquire a taste for the genre. The highlights of this selection for me are a pair of arias from Bach’s St Matthew Passion, Wagner’s Song of the Evening Star, and Shallow Brown, a traditional folk song arranged by Australian composer Percy Grainger. The only track I didn’t enjoy was Handel’s Why do the nations, which I can definitely live without, even if Teddy himself loves it, as all that gratuitous warbling drives me to distraction, embodying everything that I can’t stand about opera. Literary snob, unreconstructed opera philistine (sorry, Teddy).